adoption of new technologies th at drive long-term growth. greenhouse gases in the atmosphere. and productivity of individuals involved in production. science), a decline in fertility rates has been observed. sustain rapid productivity growth and inco me [13,14]. and make decisions based on a set of pre-defined rules. ing with other agents and their environment [15,16]. this simulation paradigm in the present study. kind of simulation approach [26,27]. extended families (dynasties) with infinite life horizon. (t = 1 year) through a series of instructions. according to the family traditions or their personal choice. regarded as the sum of all individuals. scribed in the Table 1 of the Section 2.3. Table 1. Development options: economic and demographic characteristics. ages. High levels of GDP/capita. Minimum a ge : 2 0 y ea r s.
trend. Minimum age: 25 years. Very low tendency to reproduction. the trend in more developed regions. function Cobb-Douglas with constant returns to physical and human capital. 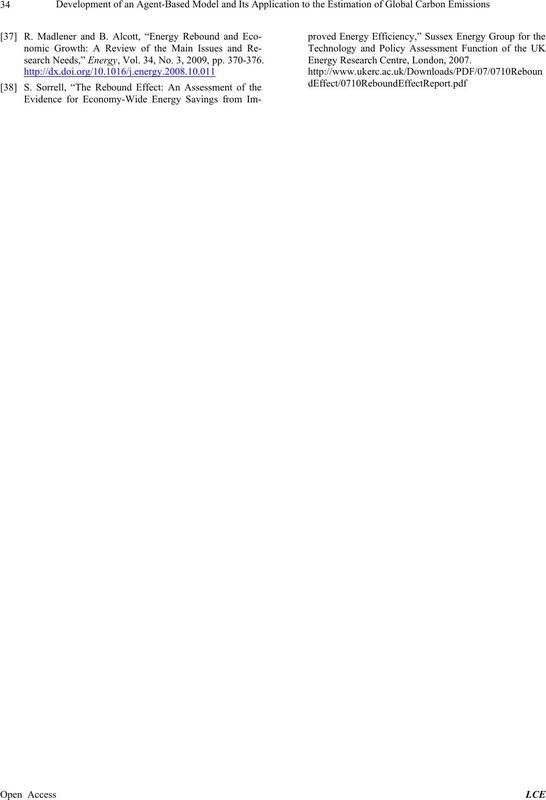 of the parameter (b) of Equation (5). and investment in capital decreases. in order to avoid destabilization of the family economy. influenced by the family backgroun d.
the number of living agents. development options were created as detailed in Table 1.
is represented by a higher development option number. < GDP/capita < GDP/capita global average. 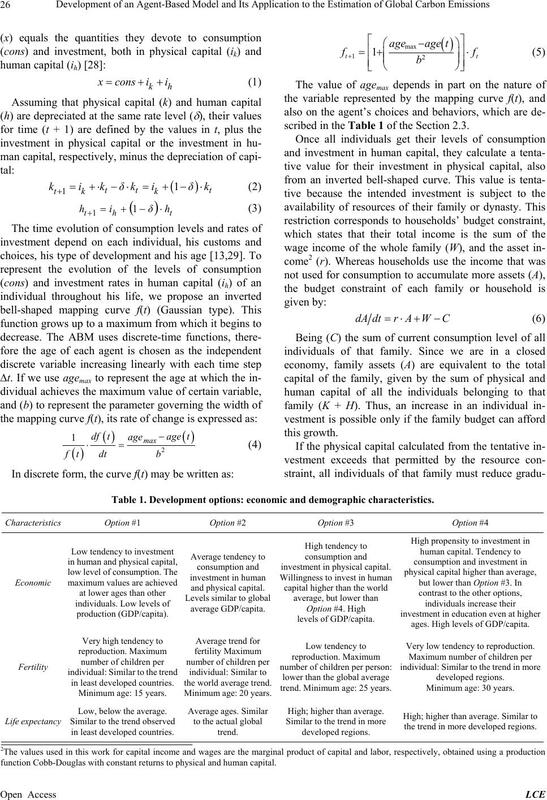 capita < 2 times GDP/capita global averag e.
in a fixed number of families (dynasties or households). amount of energy consumed per dollar of generated GDP. translated into energy savings per unit of production. carbon emissions, were compared to historical values. Table 2. 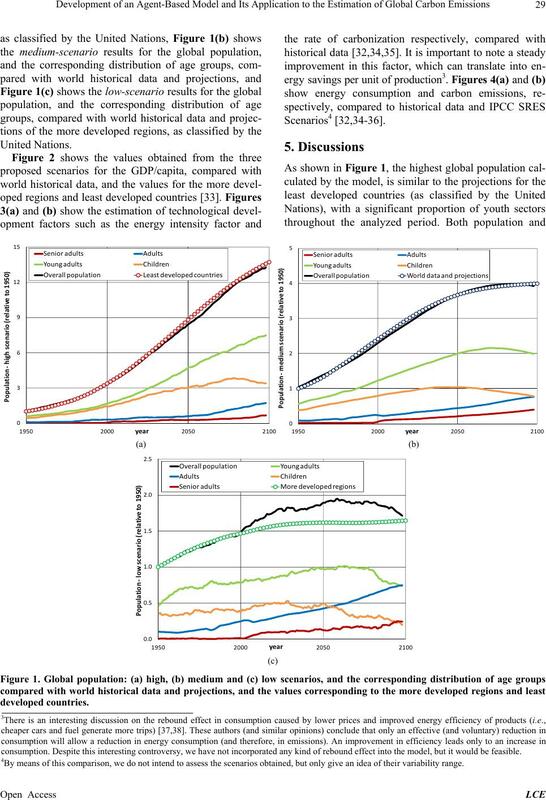 Development options: Effects on technological indicators. similar to the global trend. consumption. Despite this interesting controversy, we have not incorporated any kind of rebound effect into the model, but it would be feasible. 4By means of this comparison, we do not intend to assess the scenarios obtained, but only give an idea of their variability range. veloped regions and least develope d c ountries. youth ra tes are higher than the global data ave rage trend. tors and an increase in the proportion of older sectors. than average po pulation growth. a consequent increase in the level of carbon emissions. generally downward trend in recent years. minimum and begin to increase due to population ageing. Option #4 is vastly superior to other options. and carbon emissions, which show large positive slopes. have chosen to develop Option #3.
investment curves show a moderately increasing trend. 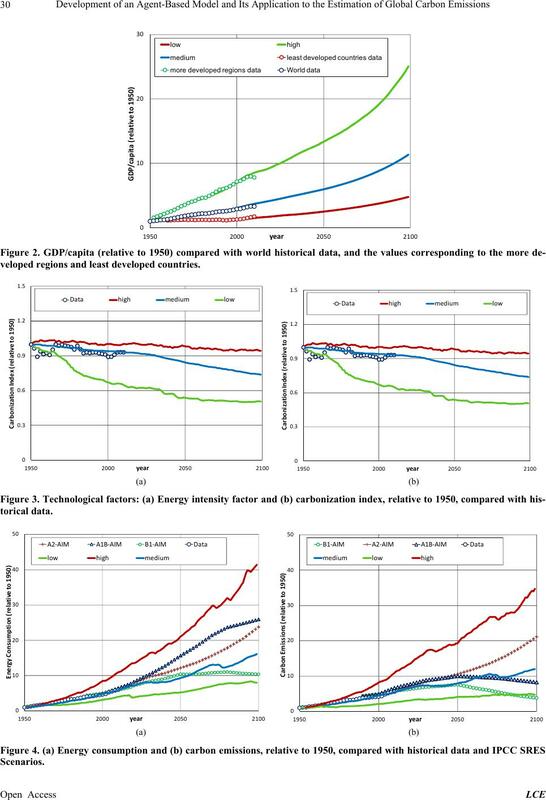 growth of energy consumption and carbon emissions. observed in the results for homogeneous societies. and an increase in productivity growth. tion of physical capital by th e population. Economic Record, Vol. 32, No. 2, 1956, pp. 334-361. Journal of Political Economy, Vol. 94, No. 5, 1986, pp. Economic Journal, Vol. 38, No. 152, 1928, pp. 543-559.
mics, Vol. 108, No. 3, 1993, pp. 681-716. Vol. 90, No. 4, 2000, pp. 806-828. 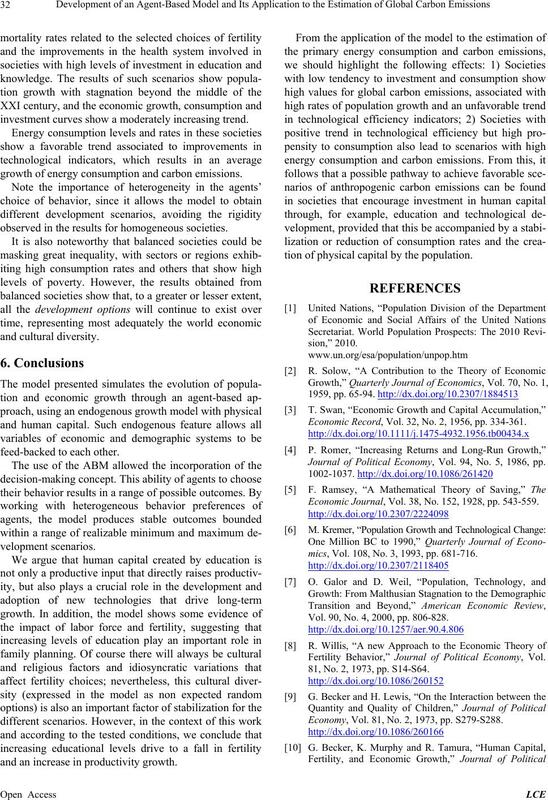 Fertility Behavior,” Journal of Political Economy, Vol. 81, No. 2, 1973, pp. S14-S64. Economy, Vol. 81, No. 2, 1973, pp. S279-S288. Economy, Vol. 98, No. 5, 1990, pp. S12-S37. Journal of Political Economy, Vol. 103, No. 4, 1995, pp. 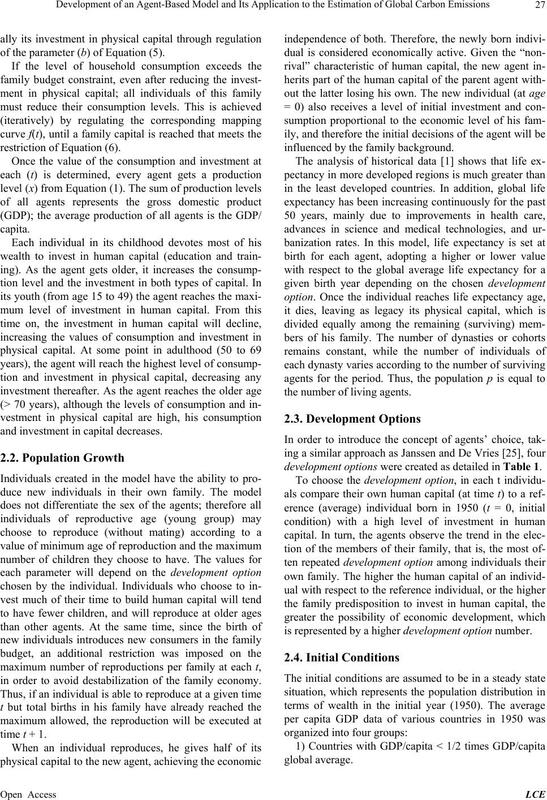 Capital, Productivity and Fertility,” Agenda, Vol. 11, No. and Multi-Agent Systems, Vol. 1, No. 1, 1998, pp. 7-38. Vol. 3, No. 3, 1999, pp. 20-27. States of America, Vol. 99, 2002, pp. 7280-7287. No. 1979, 2001, pp. 15-32. 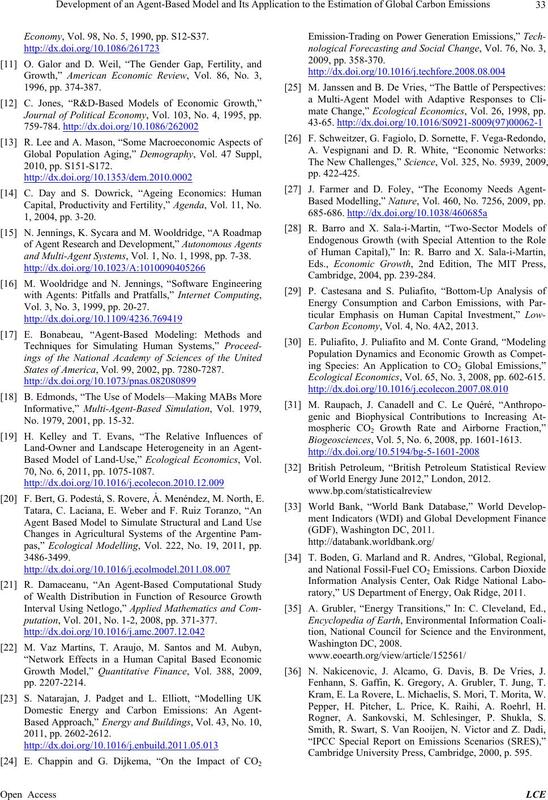 Based Model of Land-Use,” Ecological Economics, Vol. 70, No. 6, 2011, pp. 1075-1087. 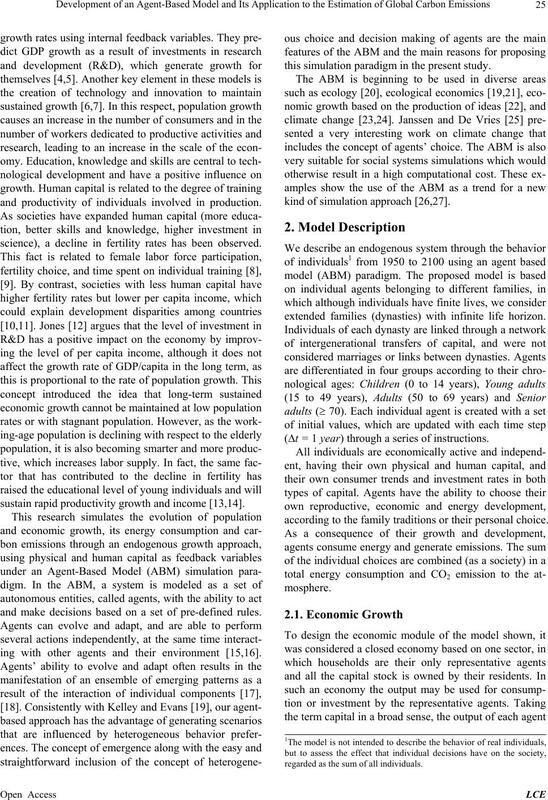 F. Bert, G. Podestá, S. Rovere, Á. Menéndez, M. North, E.
pas,” Ecological Modelling, Vol. 222, No. 19, 2011, pp. putation, Vol. 201, No. 1-2, 2008, pp. 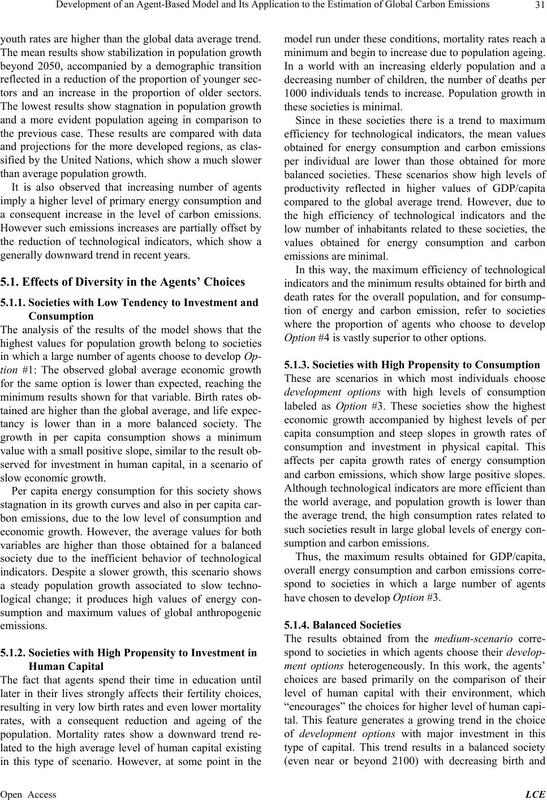 371-377.
mate Change,” Ecological Economics, Vol. 26, 1998, pp. Based Modelling,” Nature, Vol. 460, No. 7256, 2009, pp. Carbon Economy, Vol. 4, No. 4A2, 2013. 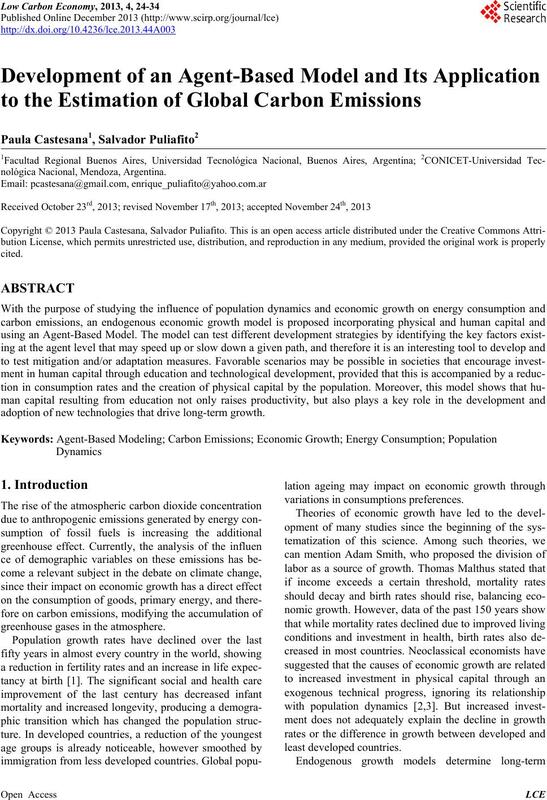 Ecological Economics, Vol. 65, No. 3, 2008, pp. 602-615. Biogeosciences, Vol. 5, No. 6, 2008, pp. 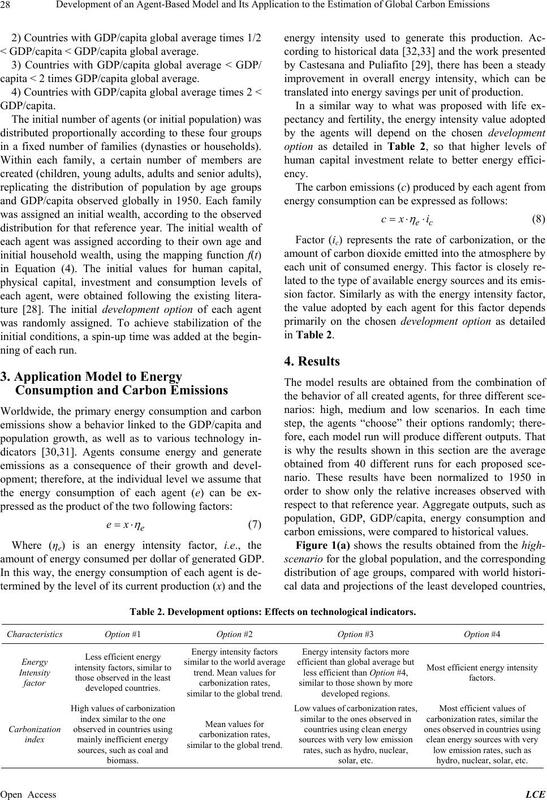 1601-1613.
of World Energy June 2012,” London, 2012.
ratory,” US Department of Energy, Oak Ridge, 2011. N. Nakicenovic, J. Alcamo, G. Davis, B. De Vries, J.
Fenhann, S. Gaffin, K. Gregory, A. Grubler, T. Jung, T.
Kram, E. La Rovere, L. Michaelis, S. Mori, T. Morita, W.
Pepper, H. Pitcher, L. Price, K. Raihi, A. Roehrl, H.
Rogner, A. Sankovski, M. Schlesinger, P. Shukla, S.
Cambridge University Press, Cambridge, 2000, p. 595.
search Needs,” Energy, Vol. 34, No. 3, 2009, pp. 370-376. Energy Research Centre, London, 2007.